Overview - February 1945. Even as victory in Europe was finally within reach, the war in the Pacific raged on. One of the most crucial and bloodiest battles of the war was the struggle for the island of Iwo Jima, which culminated with what would become one of the most iconic images in history: five Marines and a Navy corpsman raising the American flag on Mount Suribachi. The inspiring photo capturing that moment became a symbol of victory to a nation that had grown weary of war and made instant heroes of the six American soldiers at the base of the flag, some of whom would die soon after, never knowing that they had been immortalized. But the surviving flag raisers had no interest in being held up as symbols and did not consider themselves heroes they wanted only to stay on the front with their brothers in arms who were fighting and dying without fanfare or glory. 'Flags of Our Fathers' is based on the bestselling book by James Bradley with Ron Powers, which chronicled the battle of Iwo Jima and the fates of the flag raisers and some of their brothers in Easy Company. 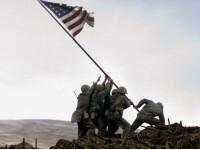 'Flags of Our Fathers' (based on the book of the same title by Ron Powers and James Bradley) focuses on the aftermath of the Battle of Iwo Jima. During the battle, a photograph was taken of a group of men hoisting the American flag atop a Japanese mountain. The now-legendary photo quickly became an inspiring symbol to Americans of the sacrifices made in the war. 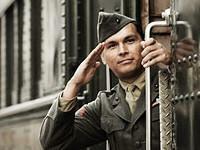 And so, in an effort to capitalize on their newfound fame, the army sent three of the surviving men who raised the flag -- John Bradley (Ryan Phillippe), Rene Gagnon (Jesse Bradford), and Ira Hayes (Adam Beach) -- back to the states as "war heroes" to help raise money for the military. Greeted with adoration at every stop, the three soldiers (still struggling with the memories of those who died in the battle) find the honor bestowed upon them as artificial and empty, having earned the recognition for simply appearing in a photograph. Critical reaction to 'Flags of Our Fathers' was largely complimentary, although the film did also see its fair share of detractors. Those expecting a war movie were disappointed by the slow pace and took issue with the filmmakers choosing to focus on the social crises of the trio of protagonists instead of more typical battlefield action. 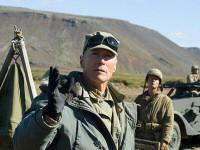 A handful of critics also complained that Eastwood appears to force an anti-war message at the height of a controversial war in Iraq. Personally, I tend to side with those who praise the film and see it as a commentary on the politics of war itself, not the current war. The performances are top notch and do a terrific job of introducing the audience to the personal struggles of these soldiers. This type of subject matter has been examined before in the context of more controversial wars like Vietnam, but 'Flags of Our Fathers' shows that political trickery is present even in the most noble of causes. The film never felt as if it were a commentary on current politics. Instead, I felt I was catching a glimpse of the all-too-often disconnect between those in power and those who fight to maintain it by risking their lives. Most of all, I was moved by a tale of men who fight more for the guy next to them than for an ideal or principle which guides society. As presented, the bonds of friendship developed during war are utterly heartbreaking at times. 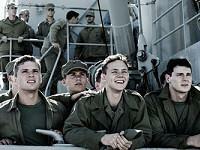 Overall, 'Flags of Our Fathers' may not be the greatest war movie ever made, but it's a pretty good one. It's best viewed alongside its sister piece, 'Letters from Iwo Jima,' but it stands well on its own as an examination of wartime politics and the dehumanization of the men who fight. I definitely recommend giving this character study on the effects of wartime politics a try. Just be warned, if you're expecting something akin to 'Saving Private Ryan,' you're likely to be disappointed. Presented in 1080p with the AVC MPEG-4 codec, this Blu-ray release release of 'Flags of Our Fathers' boasts a stunning picture quality that captures every nuance and detail of the film. The dark shadows of the battlefield have excellent black levels and shadow delineation, adding a nice level of dimension to the picture. Contrast levels and vivid colors also inject a natural sense of depth (even when the palette is muted during the washed out battle scenes). Fine object detail is phenomenal -- bullets kick up flecks of rock and dirt, individual fingers can be clearly counted on soldiers in the distance, and the textures of uniforms, netting, and stubble are wonderful. Skintones are warm but realistic in the American scenes and purposefully bleached during the battle scenes. The source is never a problem -- there's a light grain that never distracts, and I couldn't find any instances of artifacting, crush issues, or noise. I found only two minor issues with the visual presentation. First, there are a couple of instances of faint color banding in the gray skies during the Battle of Iwo Jima. However, I was staring at key areas of the screen just to see if the problem would pop up. Most people won't catch the banding at all and it certainly didn't detract from this extremely impressive video presentation. Second, some of the seams of the special effects are exposed by the high-def presentation. This isn't the fault of the transfer per se, and with time I'm sure that the effects houses will catch up with the heightened scrutiny that comes with high definition. As has become customary with Paramount releases, 'Flags of our Fathers' comes with different encodes depending on which next-gen format you prefer. In a side by side comparison of the film between the the AVC MPEG-4 transfer on this Blu-ray version and the VC-1 transfer on the HD DVD, it does seem that the Blu-ray/AVC encode is the tiniest bit sharper, while the HD DVD/VC-1 is the slightest bit softer. Neither is an advantage to my eyes and each encode is identical otherwise -- fans of both camps should be ecstatic to see this film looking so good. 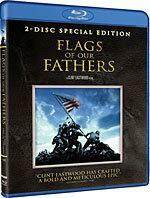 This Blu-ray edition of 'Flags of Our Fathers' falls just short of a somewhat superior audio presentation on the HD DVD version. Featuring a standard Dolby Digital 5.1 track (640 kbps), it does its job well enough, but feels slightly thinner -- especially when explosions are raging from all angles. The bass tones tend to sound a bit more throaty on this Blu-ray version, while they're a bit more resonant on the HD DVD. Dialogue is crisp and perfectly prioritized, even in the midst of the chaos of battle scenes. Impacts, voices, and explosions all have noticeably different weights in the soundscape and this attention to detail instantly increases the authenticity of the sound effects. The resulting realism made it easy to immerse myself in the soundfield and enjoy the subtle channel movement, the pinpoint accuracy, and the consistent usage of the rear speakers. Ambiance is great in the American scenes, while the battle scenes are packed with whizzes and bangs, near and far. Best of all, the surprisingly soft musical soundtrack is cautiously weaved into the film and never becomes overpowering or distracting. 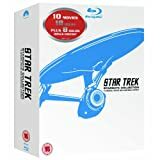 While all of the included special features can also be found on the standard-def DVD edition, each of the supplements on this Blu-ray release get the high-def upgrade, and are presented here in full 1080p video. As they've done with 'Dreamgirls' and other supplement-rich flicks, Paramount is releasing this flick on two discs, giving the film itself plenty of room to breathe on one disc without any loss in picture or audio quality, while the supplemental materials have their own stand-alone disc. The first thing you'll find on Disc 2 is an "Introduction by Clint Eastwood" (5 minutes) that everyone should take a look at. It not only describes the tone and the direction Eastwood brought to the project, but it gives the director a chance to outline his thoughts on the way America has changed over the years. As with the rest of the features, political opinions are generalized and there are no agendas beyond honoring the memory of fallen soldiers. Next up are a series of featurettes which are basically separate sections of a full length Making-Of documentary. "Words on a Page" (17 minutes) takes a look at the genesis of the original story; "Six Brave Men" (20 minutes) focuses on the men who helped hoist the flag in the life-changing photograph; "The Making of an Epic" (30 minutes) tracks the creation of the film from pre-production through editing; "Raising the Flag" (4 minutes) interviews the actors involved in the project; "Visual Effects" (15 minutes) charts the path of the very convincing special effects; and "Looking Into the Past" (10 minutes) is a collection of archived battle footage from the actual conflict in Iwo Jima. Taken as a whole, these singular pieces take a fascinating look into the filmmaking process, balancing historical events, the writing of the story, and the shooting of the film very nicely. Although each section feels a little short considering all that they cover, this nice collection of featurettes kept my attention through one sitting. It's certainly worth the time and will likely enhance your appreciation and enjoyment of the film itself. 'Flags of Our Fathers' is a war film that focuses on a conflict lost in history's pages, a group of men torn between honor and the truth, and a fascinating exploration of decision makers and those carrying out their decisions. This high-def release of the film has excellent video quality, a great sound package, and an engaging series of supplements. In fact, the only knock to the disc is that there aren't more special features. The Blu-ray and HD DVD versions are nearly identical and the only thing that pushes one higher than the other is the increased audio bitrate on the HD DVD edition. Other than that small difference, fans of the film should be more than pleased with this stellar release, no matter which format they own.